Did you know that Earth Day celebrations started in the 1970s as a way to celebrate the bounty provided us all by our beautiful planet, Mother Earth? For years, FlamigFarm has joined in that celebration, making Earth Day the official Grand Re-Opening of Flamig Farm each spring. 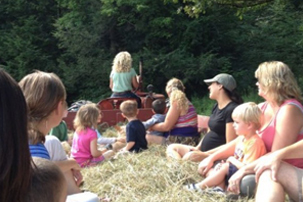 The Farm’s Earth Day celebrations include fun and learning for guests of all ages. Come for the whole day or just sample the activities for a morning or afternoon. Your heart will be filled with new reverence for our planet, your tummy with delicious food and you will snap memorable photos capturing laughter and joy. Admission is half price at $3 per person (babies under one and adults at least 80 years old are free). All visitors will receive a free cup of grain to feed to our adorable and friendly animals.